...non-MLS game last night. And it was glorious. NASL's NY Cosmos traveled out to play USL's Sacramento Republic FC for a preseason match last night and ended up beating them 1-3. There was no stream of the game (for whatever reason), nor was it on television. This morning I woke up thinking that there is something wonderful about this game. Something special. I don't think it's the start of a movement or anything but it is certainly a sign. What I keep coming back to is that the United States does not need Major League Soccer to survive. The sport existed in this country for nearly 100 years before this latest league and I'm sure it will exist another hundred in whatever form going forward. Maybe it's the combination of a snowy Columbus morn and my coffee kicking in to that is making this beautiful dance in my head over this match last night - but - what we had was a NY Cosmos team that is rooted pre-MLS superstardom vs. facing off against a sort of postmodern-non-MLS team in Sacramento Republic FC. Nothing is up over at MLS headquarters about the game yet but when it is I'm sure we will get a story that reminds us of Sacramento's ties to MLS, which they no doubt have in their affiliation with San Jose along with the club's aspiration to be a top level team. Ultimately it might say "this is the growth that MLS has brought to the game in the US." Not going to find me arguing that but what I will point out is MLS was helped by the 94 world cup and the old NASL while the old NASL was helped by the International Soccer League and the ASL and on and on. Because the United States does not have a truly independent governing body and a linked pyramid we get this ever evolving landscape of pro leagues that ebbs and flows on the whims of pop-culture. What hasn't wavered, however, is the popularity of the sport of soccer in this country. It's always been popular. From immigrants setting up leagues at the turn of the last century to the game spreading to major cities in the midwest (like Detroit and Cleveland) during the automobile manufacturing boom post WWII - to the a super nova that was the NASL to the youth soccer explosion that followed in the suburbs all up and down the east coast at first but moving out to the suburbs of the midwest - to where it is now (which is basically California and hopefully moving out of the suburbs). The sport needs a fresh change in the US and last night shows us that we have something magnificent happening right now. Something that doesn't need franchise fees or soccer specific stadiums or allocation money or research teams recommending the best TV markets that determine the next "division 1" team. The sport doesn't need that. Has never needed that. We have dozens of "Sacramento's" in the US. 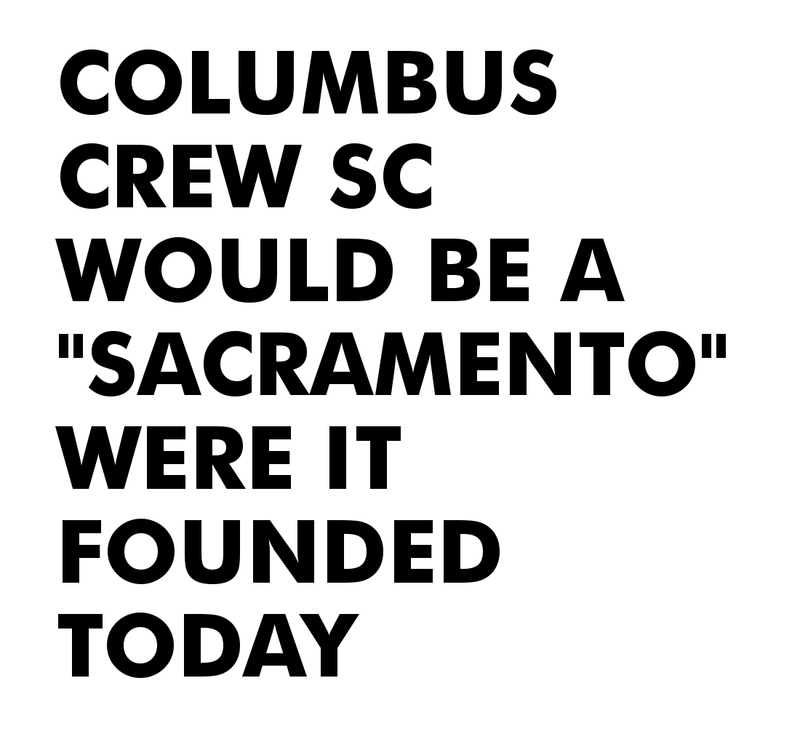 Columbus would be a "Sacramento" if it were started today and not back in 1995 at the dawn of MLS. I look at 12 yr old Carolina Challenge Cup of which the Charleston Battery hosted this year with NY City FC and Orlando and see that area, relatively untouched by MLS until last year, showing that they could be a Sacramento - specifically because it doesn't have the baggage that MLS carries. There's a global party happening where everyone is welcome and you only need to ask to take part. Last night saw a two clubs and their fans spend a few hours dancing the night away with the world. Today MLS "fans" wake up to "division 1" pro soccer news of labor negotiations and the threat of a delayed season start over player freedom while arguments on social media rage over whatever the latest fine to be handed out is. I wonder what the players, owners, investors and fans at that Cosmos / Republic match last night think of all that mess. I doubt they are thinking hardly anything about it today. My hope is that they think nothing of it in the future. @Adam - thanks man! Great to hear from you. Where have you been? Have I missed your writing somehow? Wonderful to see your name out there. Hope all is well.